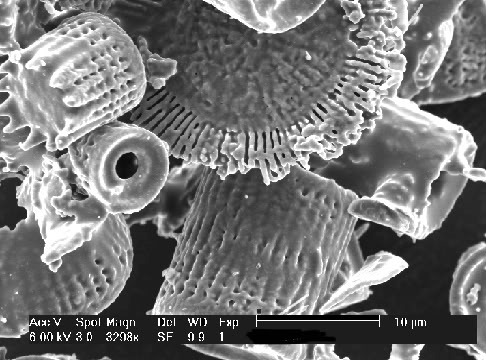 Diatomaceous Earth (DE) comes from the fossilised remains of one-celled plants (phytoplankton) called diatoms. It is also sometimes called Fossil Shell Flour. Examined under a microscope and magnified 7000x these tiny diatoms appear as spiny honeycombs or tiny cheese-grater like cylinders. These microscopic cylinders are extremely hard and sharp. On the hardness scale, diamonds are 9, Diatomaceous Earth is 7, insect exo-skeletons are typically rated a 3. DE works by attaching itself to the outsides of intestinal parasites and external insects and causing them to dehydrate which kills them. Poultry, pets and livestock can be dusted or brushed in DE as a chemical free aid to remove external parasites such as fleas, ticks, mites and lice. It also works extremely well for people with lice and nits. DE has a long history of use for internal parasite control in humans, poultry, farm animals, domestic pets and equestrian applications. When used internally on a daily basis, the honeycombs of the DE act to lacerate internal worms which makes them release their grip on the intestinal walls so they are passed out with the bowel motion. The gut lining has a mucosal layer which means the DE does not affect the gut tissue. DE will help to cleanse the colon and intestinal passages and this cleansing effect helps to remove excess mucus and bad bacterial populations internally which may have occurred over time. This provides a greater ability to absorb nutrients being provided. Purely Earth’s Diatomaceous Earth is 89 – 95 percent amorphous silica. As well as being very high in silica, it contains 15 essential trace minerals including phosphorous, selenium, calcium, sodium, potassium, magnesium, copper, zinc and iron. Silica is the most plentiful element on earth, following oxygen. There are however, very few foods that contain an adequate amount to supply the quantity your body needs. Green vegetables and the shells of crustaceans are the richest sources. Silica is crucial to bones, tendons, skin, cartilage and blood vessels. Silica is even located in the blood itself and important organs such as the liver, heart, and lungs. DE is a great way of increasing silica content in the diet and if used on home vegetable gardens, will increase the silica content of that food supply. As well as having the trace minerals, DE particles are negatively charged. Heavy metals, a number of pathogenic bacteria and viruses, pesticides and drug residues are typically positively charged. As the tiny particles of DE sweep through the digestive tract they attract or draw in the positively charged nasties, capture them within their framework and consequentially pass them out as waste. Regular consumption of DE can therefore have a powerful detoxifying effect. We find this process is enhanced when DE is mixed 50/50 with Purely Earth Clay and taken as a slurry. Improved feed conversion, greater weight gains, improved immune systems, better coats and hooves and overall health are often on the list of positive changes noticed by farmers when DE is mixed with animal feeds. It is an excellent animal wormer and if put into nesting boxes and dust bath areas, can effectively control mites in poultry. Used on the vegetable garden at a rate of 2.5kg per acre, it will increase the resilience of plants and improve their silica content which is good news for anyone or anything eating them. People who have used it regularly often comment on improved bowel function, greater regularity, less allergic responses, more energy, better skin, hair and nails, lower cholesterol, better blood pressure, less stiffness, improved immunity, improved mood and better sleep. In our experience it is wonderful for breaking down pathogenic bio-films in the gut. It has also been used by municipal water suppliers to remove bio-films during water treatment.Topically, it is an excellent nit and lice treatment. For information on how to use Purely Earth Diatomaceous Earth Click Here. DE production staff working in food grade DE mines in the US have not reported ill effects from prolonged and regular inhalation of dust in the workplace. Despite this, dust inhalation of any kind, especially in a pro-longed nature should be considered un-healthy and best avoided. Please take this into consideration when dusting DE through animals coats or applying as a powder to fruits or vegetables as a means of insect control. Wear a mask and dust animals outdoors. (You can mix it with water and spray on to vegetables and fruit to reduce the dust. It will kill aphids, mealy bugs, scale, caterpillars and other insects but must be applied directly to them or be where they crawl. If it doesn’t touch their bodies it won’t work). Asthma suffers or other lung ailments should certainly take extra careful and take additional precautions and be conscious not to breathe in the ultra-fine dust particles. DE can be drying to your skin, hands, and feet, similarly to your pets. Be sure to wash off skin, feet or hooves. If you suffer from dry skin you may consider using gloves when handling DE. Some people have the potential to experience a healing crisis (detox reaction) when beginning DE consumption. If you try it internally and this occurs, reduce the dose and increase in slow increments until the full dose is reached. You can apply it to control fleas in carpet and bedding. Be aware however that there have been reports of excessive volumes of DE causing issues with certain vacuum cleaners. DE can be used to soak up spills such as red wine and will just vacuum up when dry. DE has absolutely nil withholding period when sprayed on fruit and vegetables destined for human consumption. It is harmless and you could spray, pick and eat it all in the same day. NEVER use pool filter grade, industrial grade or any diatomaceous earth other than those that meet food safety standards for yourself or your animals. It can poison or kill them. Don’t settle for anything less than the best grade DE for your home, your family, pets, farm or horticultural uses. Purely Earth’s Diatomaceous Earth has OMRI (Organic Materials Review Institute) status and is certified Organic in the United States. New Zealand Organic status has recently been granted by BioGro – BG5339. Storage – We recommend you store your DE in an airtight container. DE, water and humidity don’t mix from a storage perspective. Ensure the DE you buy is Fresh-water based, BioGro & OMRI registered and that it meets food safety standards. DE that is intended for other applications may be not be pure enough and may be harmful as a result.